Way across the pond, there is a special place called The Artistic Stamper Creative Store & Art Bar, and the owner of said store Jennie Boxall, had asked me months ago to Guest Design for the store's blog, The Artistic Stamper Creative Team Blog, and of course I SQUEALED, "YES YES YES! ", and I received a plethora of stamps to work with! Talk about generous! BUT, I had to put her off for several months as I was just swamped with commitments. So finally, I was able to commit, and here is a sneaky peek at my first project, and the rest of it can be seen here. Many many thanks to Jennie and Emma (The right hand lady!) for putting up with me, and having so much patience! I am deeply honored you asked me to showcase many of your FABULOUS stamps!!! Looks great, going to go check it out. 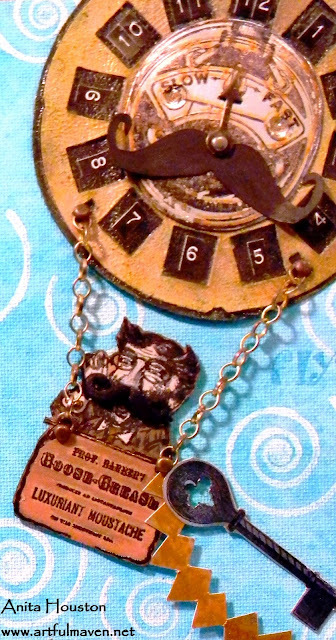 I love this whimsical take on Steampunk, Anita. It's really clever the way you combined that cool speedometer with Tim's picture wheel to form your hot air balloon. Blessings! I just love the creative ideas you have Anita, this is a fabulous canvas with lots of inspiration and a great step by step. TFS. So fun, I had to visit and see the completed piece. You rocked it! That professor is just adorable, and love the sun . Looks fabulous. Can't wait to see more. Going over now!!!! What a fabulous sneak peek! Fantastic to have you with us at The Artistic Stamper this month... can't wait to see what else you have in store, but for now I'm off to check out this one! Love this!!! You are just too super creative> How did you ever think of this? Went over and saw the whole thing, Wow! Love it, especially the 'stache, such a cute idea. That's cool, I love it. Love this sneak peek heading over to check it out!! You know I love the whimsy in this piece! That mustache just cracks me up! Off to see the entire piece, and then I really AM going to hit the treadmill! Ok... that is just so cool; love the mustache! !